We have been able to put together a product that is not only affordable but high quality and in a great location. Like Mark shows, people spend more than this on a time share, and this you actually own. Mark Bryson, was staying at an All-Inclusive resort in the Riviera Maya. He and his family had heard about a local nature park and when they were offered free tickets by his resort he jumped at the chance. All they had to do was sit through a 45 minute presentation on vacation ownership when they came back. That was 4 years ago. The 45 minute presentation actually took 7 hours, and the vacation ownership was a time share package that mark paid $74,000 dollars for. Since that day Mark has never seen a check. His $74,000 investment has cost him many thousands of dollars more in maintenance fees, and he today pays nearly the same amount to stay that that same resort as he did before he spent the $74,000. “Before I paid $74,000 the resort cost me $400 a night, today the resort costs me $400 a night, nothing changed.” So the last thing you would expect Mark to be doing is buying real estate in the Riviera Maya. People all over are astounded at the value that Caribbean Living is able to bring. 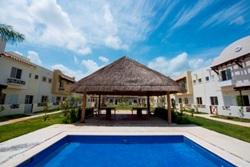 A 2-bedroom condo right in the newly built and extremely safe area of Playa del Carmen, long considered the jewel of the Riviera Maya, that is only 5 minutes to the beach, all for under $70,000 USD, there has to be a catch.